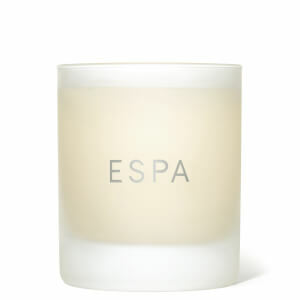 An aromatic blend with pure essential oils Sweet Orange, Lavender and Palmarosa to comfort, calm and rebalance the senses. 40 hours burn time. Trim wick to 3mm before relighting to optimise burn time and minimise smoke. For safety, always ensure the candle is placed on the cork mat. Always burn in a draft free area . Added care advice: Container will become hot, never place on any unprotected or polished surface. Never leave a burning candle unattended. Always leave 15cm between burning candles. Burn candle away from walls and overhanging surfaces, draughts, other heat sources and flammable materials. Burn candle out of reach of children and pets. Keep wick trimmed to 3mm, but never leave fragments of wick or match in the candle after lighting. Never allow the flame to touch the side of the glass and cease burning if it does. Extinguish flame and allow to cool before handling or moving. Burn for maximum 4 hours ata time. Please leave 10mm of un-melted wax in bottom of the glass to avoid excessive heat. Extinguish candle if it smokes, flickers repeatedly, or the flame becomes too high. Never use if there is damage to the container. Warning may cause an allergic skin reaction. Causes serious eye irritation. Harmful to aquatic life with long lasting effects. Contains Citronellal, DL-Citronellol, Geranyl Acetate. May produce an allergic reaction. Avoid release to the environment. If on skin: wash with plenty of soap and water. If in eyes: rinse cautiously with water for several minutes. Remove contact lenses, if present and easy to do. Continue rinsing. If skin irritation or rash occurs: get medical advice/attention. If eye irritation persists: get medical advice/ attention. Dispose of contents/ container to approved disposal site, in accordance with local regulations.